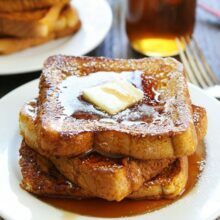 Pumpkin French Toast-thick slices of bread dipped in a pumpkin spice mixture, cooked in butter, and drizzled with pure maple syrup. My boys requested French toast for breakfast on Sunday morning. I was ok with their request, but I was in the mood for something fall so I made Pumpkin French Toast. 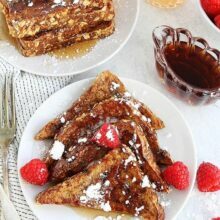 I tend to go pumpkin crazy every fall so I was worried they would roll their eyes and object, but they actually loved the idea of Pumpkin French Toast, especially after they tasted it. French toast is my favorite breakfast splurge and my pumpkin version is worth every single bite. It is SO good! I dip thick slices of Texas toast into a mixture of pumpkin, eggs, milk, brown sugar, cinnamon, pumpkin pie spice, and vanilla. To serve, I top the Pumpkin French toast with more butter, pure maple syrup, and dusting of powdered sugar. My boys devoured their French toast. 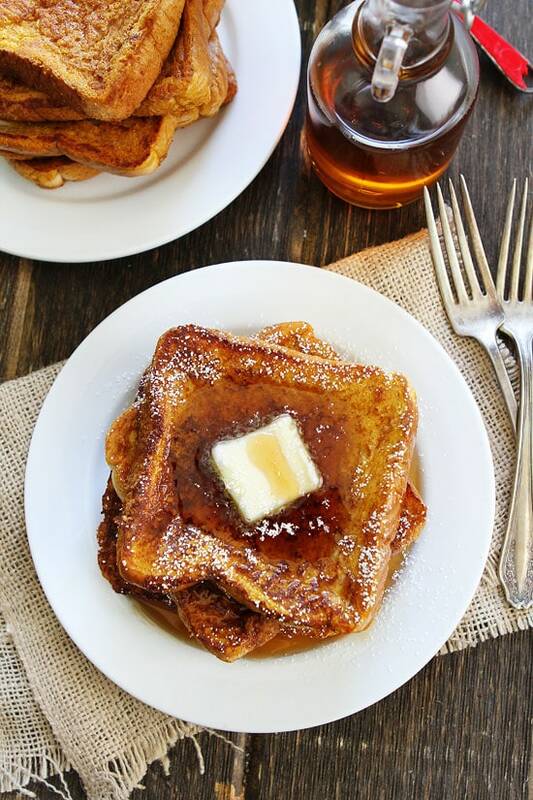 I have a feeling they are going to be asking for Pumpkin French Toast every Sunday morning…and I am ok with that. I am already craving more of this heavenly Pumpkin French Toast! This Pumpkin French Toast is perfect fall breakfast treat! Go treat yourself! Enjoy! 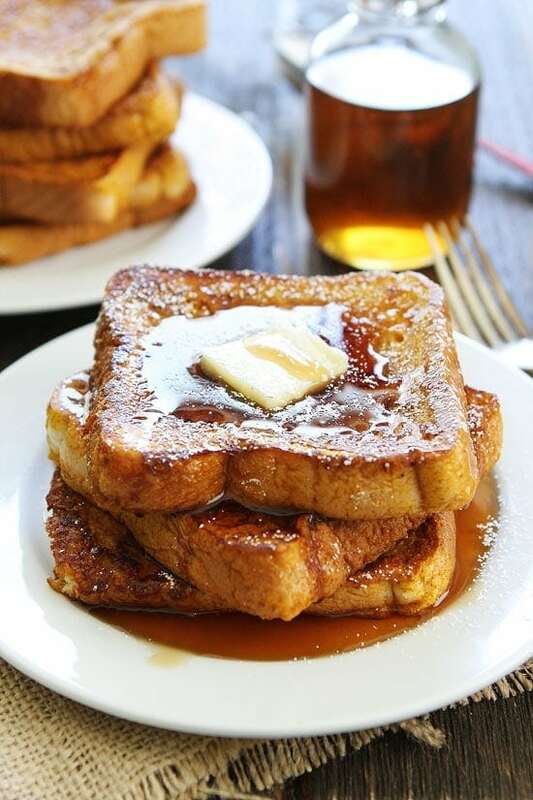 Thick slices of bread dipped in a pumpkin spice mixture, cooked in butter, and drizzled with pure maple syrup. This is the perfect fall breakfast! Preheat electric griddle and set aside. In a 9x13 pan or a large mixing bowl, whisk together eggs, milk, pumpkin, brown sugar, vanilla extract, cinnamon, and pumpkin pie spice. Dip both sides of each slice of bread into the egg mixture, allowing the bread to soak up some of the mixture. Transfer slices of bread carefully to the griddle and cook until golden brown, about 3-4 minutes. Flip and cook on the other side until golden brown. Repeat with all slices of bread until coating mixture is gone. Serve Pumpkin French toast warm with maple syrup, butter, and powdered sugar, if desired. Note-We like to use a 9x13 pan to make the French toast because it is shallow, easier than a bowl. If you don't have an electric griddle you can use a non-stick skillet. Cook over medium heat. 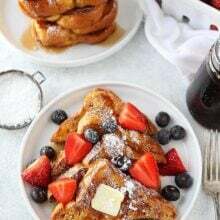 French toast is best warm the day it is made, but you can keep it in the fridge for up to 3 days or in the freezer for up to 2 months. Reheat in the toaster or microwave. I completely agree – the aroma wafting through the house whilst these cook can make even the laziest of people get running to the kitchen! I’m loving the pumpkin flavors in these, so perfect for fall! Who knew you could make even french toast better by adding pumpkin? This look amazing!! Pinning! 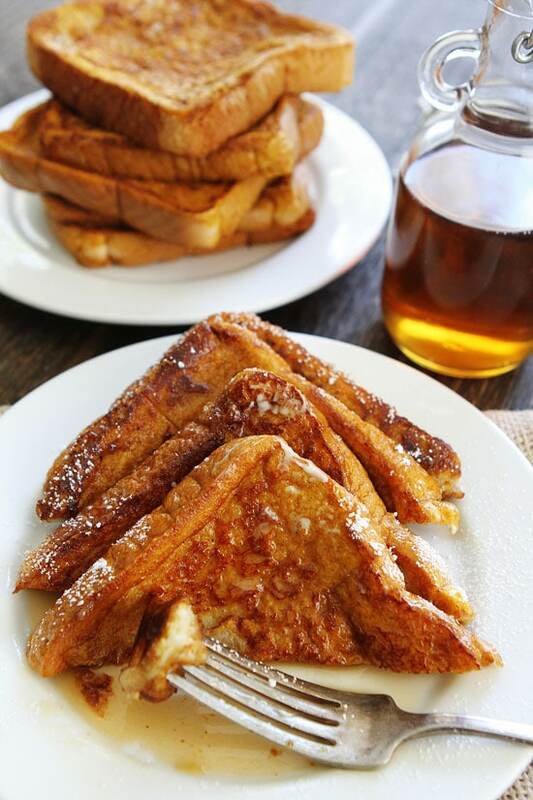 French toast is the best!! I love this pumpkin version! I think I could eat this everyday for breakfast! This pumpkin French toast is everything! So seasonally perfect! Seriously this is the best breakfast ever!! there may be nothing better in the world! yummy!!! 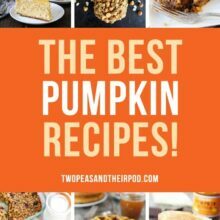 this is my favorite pumpkin recipe I’ve seen!! SO delicious, I can just imagine the smell! Definitely couldn’t pass up a plate of THESE!!! Love Pumpkin Everything this time of year. Great idea! Wow! What a scrumptious breakfast! I love your autumn twist on French toast. Oh, I am going to make this! Sounds DELICIOUS! OMG! I am not usually a French toast person but I think I will be now! I am not sure what recipe I was looking for when I found this site but i saw this one and decided to try it. I made a double batch and my husband and two teenage boys loved it!!! I will defintely be digging around in the archives for recipes and anxiously awaiting new ones. So yummy! I like the way you decor for this food, it makes them becomes attractive. This is the favorite food of my child; your post makes me have some fresh ideas to decor it. 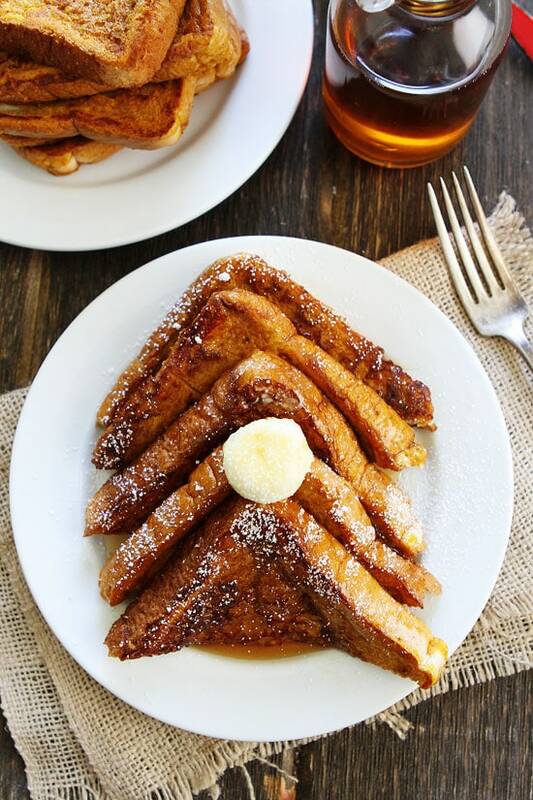 Love this pumpkin french toast! Such a lovely recipe! This was yummy. I’d make it again as a seasonal item but it’s nothing to rave over. 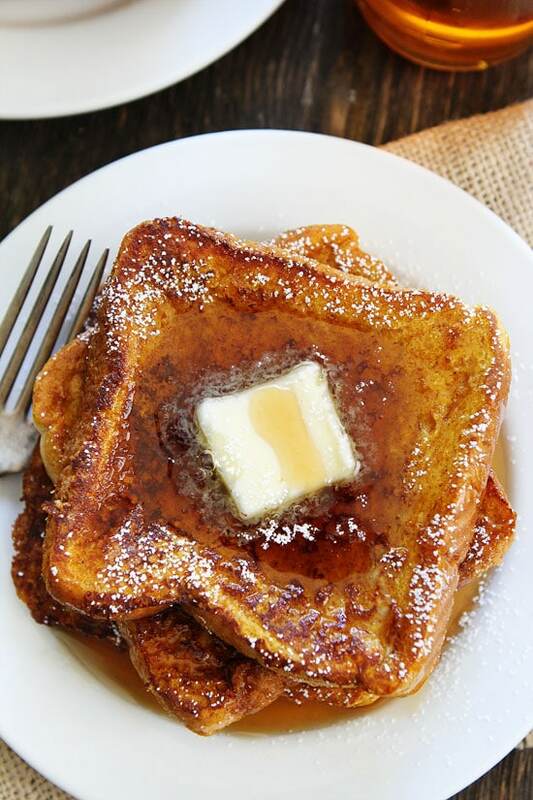 Pingback: Pumpkin French Toast | Thanksgiving Breakfast | What's for breakfast? This was so easy to make and was so yummy! I like the way you think. I made your potato rosemary soup the other day (which was a hit). 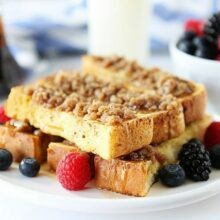 The next day I searched the words pumpkin french toast because I had a hankering to use up some homemade bread. I was drowning in suggested recipes and your adorable blog name popped out at me AGAIN. SO I perused your recipe and it looked decent enough and trusted your judgement (since you won me over with the soup). I always make my own changes to a recipe. (What mom chef doesn’t?) However, with your recipes I change practically nothing. The soup I added a little celery salt…this french toast I exchanged vanilla extract for maple extract. Once again, a winner that my family loved. A very honest simplistic taste that speaks of autumn and impeccable directions. Thanks for sharing! could this still work using challah bread you think? 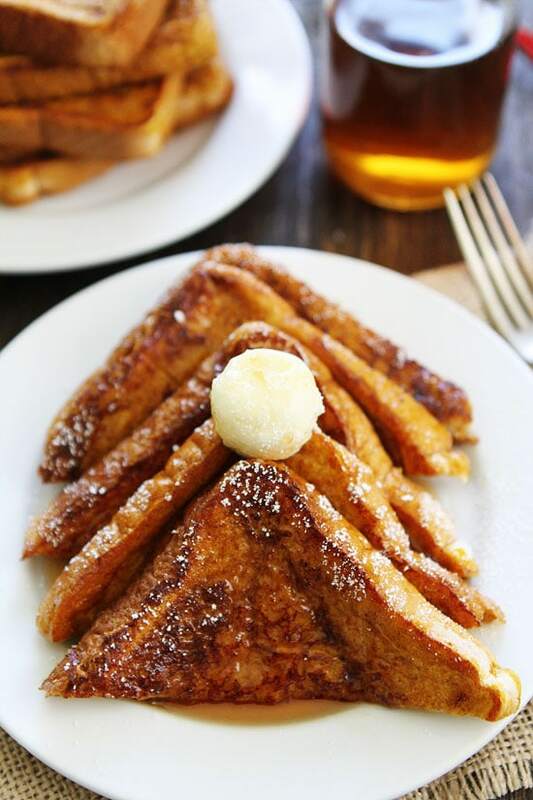 Pumpkin and French toast. Great combination! Thanks for your sharing! Made this for breakfast this morning and it was a huge hit! Love the pumpkin flavor – perfect for this time of year. I didn’t have pumpkin pie spice, so I just added nutmeg, cloves, and ginger separately. Great meal – I will definitely make it again. Glad you liked the French toast! THIS IS THE BEST FRENCH TOAST EVER!! !